Me in my basement-cleaning uniform. This morning at 9 a.m. 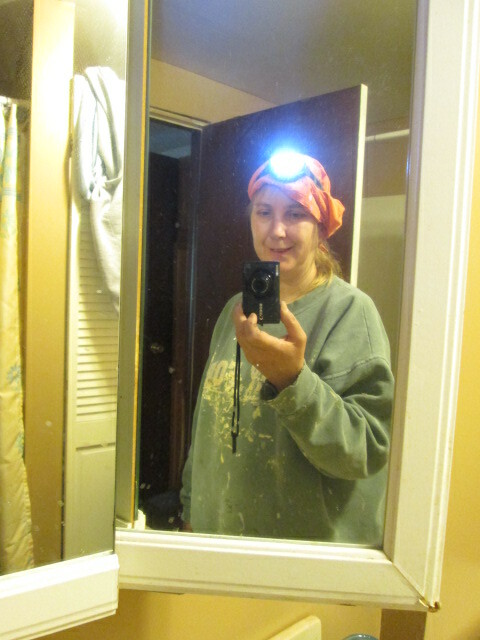 I got dressed in my “Cleaning the Basement” uniform–work jeans and sweatshirt, headscarf, headlight, and work gloves–and headed for the basement. I had conquered my fear and worked in the musty spidery basement without any anxiety. I have confronted a lot of scary things in my life and one really cool thing that I have learned about fear is that it’s a bully who backs down when you confront it. 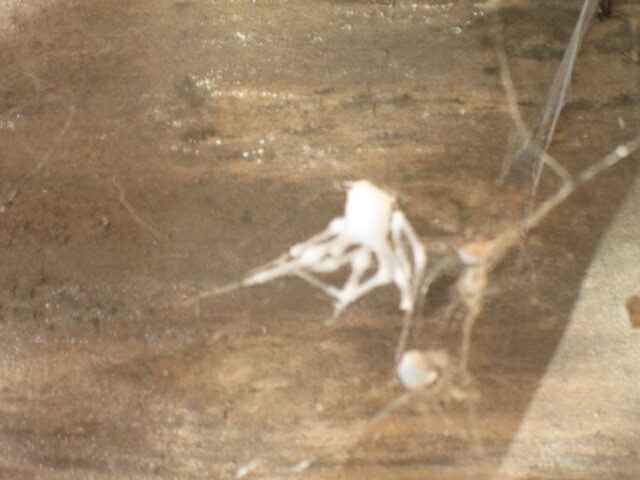 I saw only one or two spiders while I was I was down there and they quickly darted away. I also saw a strange looking creature on an old cabinet. It looked sort of like a white octopus. There were a couple smaller ones nearby. I have never seen such a thing before so I took a picture of it. I put some stuff in the car to donate and I hauled old falling apart cabinets and a bunch of other junk into the yard. EJ and I had discussed whether to fill the pickup with junk and haul it to the landfill or rent a dumpster. When I saw the pile of junk growing, I texted EJ to ask if he wanted to just rent the dumpster afterall. Since they will drop off and pick up the dumpster, we won’t have to take the time to drive to the landfill. He said yes, so I called the rental place. They told me that they won’t have any until May 29th. Ok. I reserved one. Then I went back to cleaning the basement. I worked until about 2 p.m. and I was amazed and proud of all the progress I made. I want to clean enough of the basement so that we can easily haul out the chest freezer, shelves, and EJ’s tools and stuff. I also wanted to make the old furnace accessible so maybe we can get a furnace guy to come while I’m still down here so he can plan what needs to be done to install a new furnace. I don’t know how we are going to arrange to get the furnace in since we will all be in the north soon. I am watching the days quickly pass by and I have a lot to do so after I ate lunch, I went out to paint. I painted a strip of green trim on the back porch, painted the garage door, and painted our front door…all green. Then I started painting the trim on the garage. I got all the parts done that I could do without getting out the ladder. It was getting late so I thought I’d finish up another day. I will probably need EJ or JJ to paint the way up high places. I painted the cream parts of the front porch on Monday. I will paint the red floor later. I painted some of the green trim on the garage. In front of the garage is the pile of junk I hauled out of the basement. I came inside and took a shower to wash off basement dirt and green paint. I had just sat down when the phone rang. It was our mortgage officer. She said that once EJ arranges for house insurance–which he needs to do ASAP–we can schedule closing. She said it’s possible we could schedule the closing for Tuesday. All my plans were made for closing on Monday, June 1. I have arranged to have the dumpster dropped off May 29th, and I was hoping to get the furnace guy here and arranged for him to install a new furnace. I have to close out our other checking account, cancel our internet down here, fill out change of address cards at the post office. I was going to do all this next week! And a Tuesday closing would mean I’d have to bring the dog and seven cats up all by myself….The mortgage officer said we could schedule the closing for Friday of next week if that will work better. It might. I could dash up on Friday and then we could drive down and get the pets, and essential items like sleeping bags and cleaning supplies and clothes. Or EJ could get a power of attorney and do the closing without me on Tuesday. That would save money on the motel room. Or….EJ and I will have to discuss this when he gets home. He’s currently at the Secretary of State (i.e., DMV) getting the tags renewed on his pickup. We have arranged for EJ’s nephew to help us move on June 6th. That still hasn’t changed. He has a friend who has a commercial truck and they will come down and move us. Yay! Until then, we will be camping out in the new house, tearing out the old carpet, installing new flooring, and painting walls. Exciting indeed! But that white critter thing is creepy…. You are right, Simone. Plans often seem to get turned upside down! Ha! There will be little rest this summer after we move because we will have to keep coming south to finish up this house. But eventually we will sell this house and be able to relax in the North! Something funny is happened here I always comment as Simone Hopman and now I see your blog is calling me Simone Marike. How in the world does that blog know my second name and how did he change that??????????? Simone, if you have recently changed your name someplace else, it probably transferred over. For example, if you use gmail to sign in and then change your name at another Google site–like Google+–it will change your name at other places where you use Google. Don’t know if that makes sense. It is VERY exciting! I am oh so busy, but it’s a good sort of busy leading to good things! I think it is awesome that you are starting a blog. I think people would be interested–I know that I am interested in the bits of your life that you share at FB. Let me know if you ever make it public. Will it be in English or Dutch?